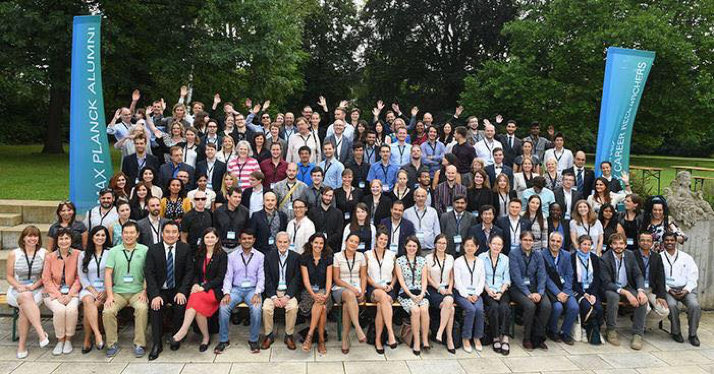 In late August this year, a networking symposium spanning almost the entirety of Max Planck based research took place in Berlin. In line with the definition of “networking” according to the Merriam-Webster Dictionary, participants exchanged information among individuals, groups, or institutions, and cultivated productive relationships for [future] employment or business. Still not sure what happened? Read on – ! Everyone knows the old adage: you need to know where you are coming from in order to know where you are going. Accordingly, in late August the Max Planck Society (MPS) invited Alumni and early career researchers of or within the MPS to the idyllic Harnack House in the southwest of Berlin for a networking symposium designed to touch base on their individual roots, formulate clear mission statements for a newly established Max Planck Alumni Association (MPAA), and to foster multi-disciplinary discussions about the developments within the research system both in Germany and internationally. But let’s take a step back – approximately 100 current and 100 previous Max Planck researchers and staff members followed the call for the three-day networking symposium in Berlin. The schedule included plenary lectures, mini sessions, and workgroup meetings with topics ranging from formulating the cornerstones of the MPAA, to a comparison of the scientific landscape across the EU and the US, to future job and entrepreneur possibilities, social media branding of the MPAA, and many more. Now you may say that this is all good and well, but why do we even need the MPAA and what would it be good for? And perhaps most importantly, does it even make sense to establish an MPAA across such different research areas as (international) law, immunology, and physics? Moreover, during the meeting there has also been a lot of talk about shared values rooted in the Max Planck-upbringing, yet, what exactly these shared values are remained elusive. Well, starting from a statistics point of view and citing the Director of the Max Planck Institute for Biophysical Chemistry in Göttingen, Reinhard Jahn, during his plenary talk, a significantly higher proportion of MP alumni stay in academia than from most other (inter-)national research institutions. In fact, at the PostDoc level an estimated 50% of MP alumni remain on the academic track, as opposed to approximately only 20% of PostDocs from other institutions. Moreover, when comparing the MPS to other research institution or even Ivy League schools in the USA, MP employs a disproportionally high amount of international students and researchers – again roughly 50%. All of these numbers speak to an extraordinary and lasting commitment by the MPS for the best research possible- which is shared by all of its members. This outstanding research spirit is also exactly what Kathy Edersheim first mentioned when asked about her perspective on the MPS. Kathy is the Senior Director of International Alumni Relations and Travel at the Association of Yale Alumni, and therefore joined this meeting to share her insight on establishing and running an alumni association. After another plenary session highlighting the shared values and common roots of MP members and alumni without any specifics, I asked her, what her outside impression of the “Max Planckees” was. In her words what defines MP alumni is an “extraordinary passion for research and science that is purely driven by curiosity and for the benefit of humankind”. Now that is a wonderful statement any research institution would be lucky to get, and it becomes even more valuable when putting it into the context of the “publish or perish” culture existing in today’s scientific research environment. To put the integrity of the results before the impact factor is unfortunately becoming increasingly rare, thus to unequivocally rely on and trust in the scientific method – no matter the research discipline – and having this attitude recognized from the outside is a merit of the MPS that is more than commendable and certainly a highly desirable shared value within the research community. Another assessment of the shared roots and values of “Max Planckees” was given by Tina Persson. Tina has the benefit of having both an inside- and outside look of the MPS: she underwent postdoctoral training at a Max Planck Institute and has since established herself as a career coach specialized in the transition from academia to industry. Tina quotes the popular internet meme “sharing is caring”, and says that in her opinion, the outstanding uniting value is the willingness and openness of Max Planck members and Alumni to share their ideas and results across disciplines and continents while aiming for excellence in research. So the inside and outside perspective of the MPS seems to be that of a particularly passionately curious research institution. Which is a wonderful reputation to have, and yet – why do we need an association to keep in touch with or track the career trajectories of MP alumni once they leave? The MPS not only provides each member with vital lessons regarding the proper conduct of research, but additionally and perhaps most importantly it also provides a highly transferrable skill-set to its alumni. Both for the high number of MP alumni continuing in academia and for those choosing a different route, having the opportunity to reach out for a quick insight into a specific career path, or inquire about the intricacies of a transatlantic relocation is invaluable. Since mentor and mentee in this case are sharing the same roots and values, there can be a shorthand and insight on both sides that is hardly met by cold-calling or blind emails. From a personal perspective, when I was deciding where to go after graduating my PhD program, I would have loved to have an alumni list available where I could have looked up whether anyone has made a similar lab-transition as I was about to embrace. It will also be a great comfort for anyone who is moving however far away from home to know that a regional Max Planck Alumni group consisting of like-minded people is already there waiting for them to join. There are currently a number of regional Max Planck Alumni groups being organized across the globe by Max Planck alumni and expats, and I am sure there will be one in a town near you very soon- or you can always open one yourself. Last but not least – what we have learned during these three days in Berlin is, that there is a bond shared by all “Max Planckees”, and that there is a lot of upheaval in the (inter-)national research community with ever-increasing numbers of PhD students but fewer academic positions, while there are more and more jobs out there for PhD graduates outside the academic track. Once fully up and running, the MPAA will be a fantastic asset especially for Max Planck PhD students and PostDocs providing guidance and support for their careers. Engage – want to organize a group abroad or lead a pilot? Discuss – what is your vision? On what should we focus on? The MPAA is currently being established. 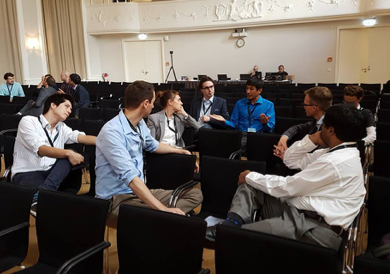 Its purpose is to connect former Max Planck members via an international network to meet, connect and exchange experiences. Anyone who has worked longer than 6 months at any Max Planck Institute (MPI) or MPRS, independent of whether he/she is still working at said MPI, is allowed to join the MPAA. Registration via the website http://www.mpg-alumni.de/ will open soon.